Well I am at a loss here.....I don't know what to write about this week's recipe for French Fridays with Dorie, Endives, Apples & Grapes. It's not that I hated it, but I didn't love it either. This is the first time, I think, that I feel so ambivalent about one of Dorie's recipes. Undoubtedly, this is a very easy recipe for a gourmet side dish. Sauté the endives, apples and grapes in butter (I used olive oil) and wait until they become tender and caramelise. I liked the sweetness of the grapes and the apples. Their sweet juices and aroma blended heavenly with the earthiness of the rosemary, but the endives were a touch too bitter for my palette. 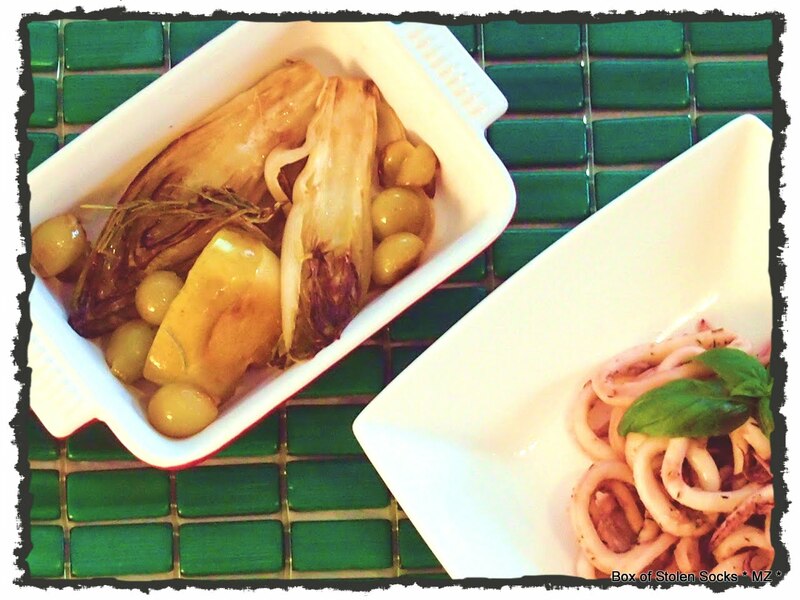 My main dish was calamari sautéed with onion, garlic and basil. Simple but quite tasty. I can admit it now... endives are not for me. The apples and the grapes were really yummy! Your side dish sounds excellent. I've never tried cooking calamari. Sorry this recipe wasn't a favorite. Hopefully you'll like next week's better! I'm glad you're going to experiment with other veggies. Look forward to reading your results! Oh, fennel...now there's a thought! I think I would like that version as well. You have such pretty dishes and linens, very nice photos with it all. The grapes are worth knowing alone, right? I might be slightly addicted to those. I'm sorry you didn't love this as I did. I think fennel would be goon too but since this has my beloved rosemary in it I will love it. I would love just about anything with that herb. love it or hate it. Even though you did not care for it, your dish looks good, especially paired with that calamari. Maria, fennel does sound like a terrific alternative to the endives in this dish - I am sure that combination would work very well! Lovely presentation of your apples, endives and grapes even if you were not all that much inspired by the final outcome! Fennel! That's it! I've been trying to think of something to replace the endive, which I also found too bitter. Fennel would be perfect. Thanks for the inspiration!. Your calamari looks great, by the way. Awwww that is a shame. As you say, it may work better with another veg. Ambivalence is fine. There are hundreds of recipes in the book, and they can't all be winners for every palette... That said, fennel sounds like a perfect match for the other flavors. Great idea! Hi Maria, I have never tried endives but now I guess I won't reading your post. I imagine something like broccoli would go well with the fruits? I think it would be lovely with fennel. Fennel sounds like such a delicious choice! 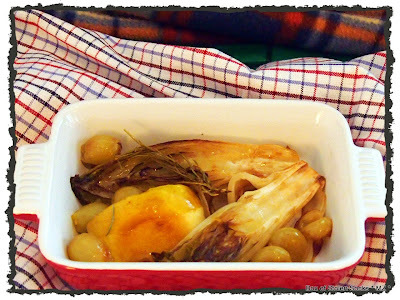 I really enjoyed this dish….but I would love to give fennel a try! Sorry this wasn’t a hit, but then there is always next time! PS...thanks for your sweet comment on my blog! I totally get what you mean! The endive tasted... not that great. I think the rest of the ingredients really made it (as well as the pork I served mine with!) Your calamari sounds great!